Timothy Keefer is chief counsel for civil rights and civil liberties for the United States Department of Homeland Security (DHS). His journey to Orthodoxy began at the age of 11 when he asked his mother for a “real” book to read. She gave him a copy of Robert Massie’s “Nicholas and Alexandra,” the story of the last Tsar of Russia. So fascinated was Timothy by this book and the country of Russia that, on the advice of one of his college teachers, he went on to major in Russian studies. During a class visit to the Holy Trinity Monastery in Jordanville, New York, Timothy thought that he may have glimpsed a little piece of heaven. At the time, he was a Protestant and set in his ways of thinking about God. After college he moved to Washington, DC and continued his language studies. One of his instructors was Russian Orthodox and he visited her church on at least one occasion. Several years later, following a marriage and subsequent divorce, Timothy would return to New York for a year. Searching for answers in his faith and failing to find any, he recalled his visit to Holy Trinity and visited the monastery twice more that year. Finding the monks to be very kind and open to discussions about the faith, Timothy became very impressed with Orthodoxy and gained much respect for it. Upon moving back to DC, Timothy became a lawyer. Still a Protestant, he was generally happy with it but eventually began to feel that something was missing. He found the Protestant faith to be too susceptible to modern trends with pastors delivering inconsistent messages from one church to the next. 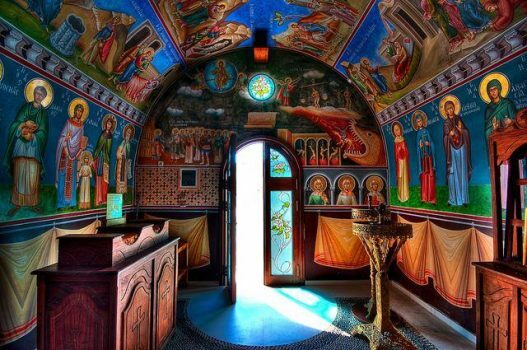 Remembering the Orthodox faith, he visited a different church each Sunday. At the Holy Cross Antiochian Church, the priest, Fr. Gregory Matthews-Green, gave Timothy a book “Common Ground: An Introduction to Eastern Christianity for the American Christian” by Jordan Bajis. The book completely changed Timothy’s way of thinking about Christianity. At the same time, a friend recommended St. Nicholas Cathedral, a church in the Russian tradition. Between the book and visits to the cathedral, Timothy began to see the truth about Orthodox Christianity. He was chrismated on Holy Saturday in 2003 with many of his Protestant friends in attendance. For some of them, it was their first time ever in an Orthodox Church. Though there were mixed reactions from family and friends, for the most part Timothy’s conversion was supported. He joyfully went on to fully embrace his life as a newly illumined Orthodox Christian.